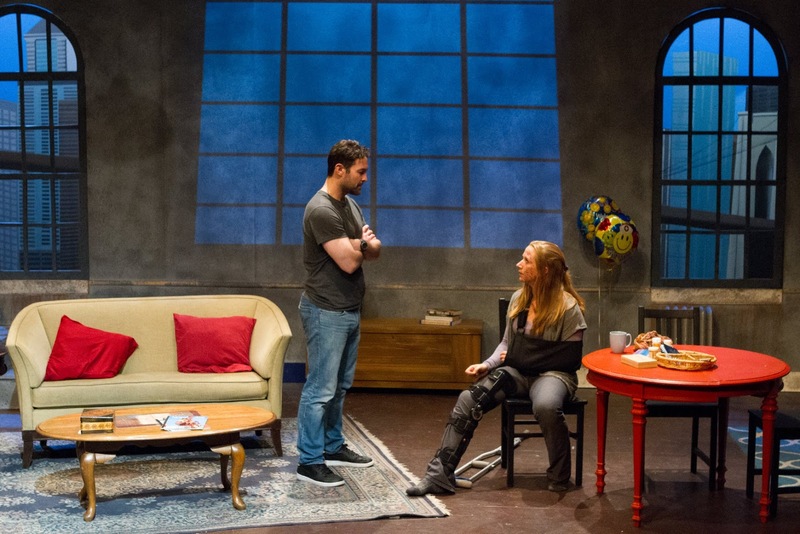 Time Stands Still, the 2009 play by Pulitzer Prize winner Donald Margulies, is being given a thoughtful revival by Ego Actus and Lung Tree Productions at Theater for the New City. Joan Kane directs this story of a photographer and a journalist, a couple who find their thrills in keeping the greater public aware of the plight of people living in war zones in the Middle East and Africa. In a year where "The Last Men of Aleppo"-a documentary about brave Syrian volunteers who rescue their compatriots from bombed buildings-was nominated for an Academy Award, this touching play is still relevant and raises all sorts of questions about people's abilities to connect. In any case, whether or not you work in a high-risk area, you may leave the theater asking yourself "is love war?" 10% of ticket sales will be donated to Physicians for Human Rights. 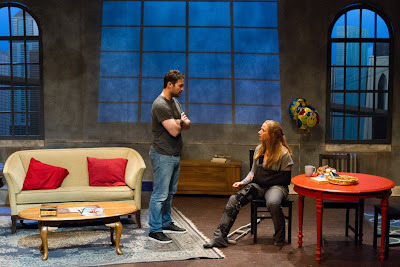 As our story opens on a spacious New York apartment, James (Timothy Weinert) is helping the injured Sarah (Maggie Alexander) up a flight of stairs and safely back into their home. We see a sweeping view of the Williamsburg Bridge; our story takes place in the formerly outré waterfront area of Brooklyn. James and Sarah, however, seem to spend most of their time on assignment overseas. After college, James walked away from a stable future and went to Somalia as a reporter. He met Sarah in East Jerusalem and the pair have since had many adventures together. In between scenes, photos of Syria by Simon S. Safieh are projected on the walls. Right now, Sarah still has bruises on her face (makeup excellently applied by and a knee brace and crutches to remind her of her last near-death experience in Mosul. Many of these details about Sarah and James are only disclosed as part of conversations with their publisher friend Richard (Malcolm Stephenson) and his new "mid-life crisis" girlfriend Mandy (Connie Castanzo), who visit the couple to welcome them back and help publish their findings. You might expect Sarah to have a short fuse, and that side surely comes out when she speaks with Mandy, who has not seen much of the world and seems sincerely in love with Richard after four months together. Richard, who once dated intelligent women his own age (even Sarah dated him 20 years ago, as we later discover) admits to a great sense of relief at his current, simpler love. With his last ex, everything had to be discussed; choosing a place for dinner "was like arbitration." We might be asking ourselves if shallow love can be true love. But then we hear of Sarah's translator ("fixer") during her assignment in Iraq. This man, Tariq, was gentle, barely spoke English according to James (Sarah says he taught himself English by reading Hemingway over and over again) and yet inspired trust and more. While James writes a subtle book on the meaning of horror films (observe the Red Scare themes in the 1950s "Invasion of the Body Snatchers"), Sarah drifts away from the relationship. They have dated for eight years but never married. Mandy, who is having Richard's baby, inspired James to propose to Sarah. James didn't have any rights regarding Sarah's hospital care, and is ready for matrimony and fatherhood. Sadly, the publishing world is not ready for the couple's work. James feels that he risks his life to show the peaceful public what is really going on. Mandy counters that we should all try to see the joy in life, otherwise what's the point? There are many ways to have a relationship. Sarah has always been an adrenaline-fueled adventure seeker. Why should James, a vital, muscular young guy, suddenly want to settle down and lose all the freedom he has always had? How did James figure out that Sarah and Tariq (who was blown up by a roadside bomb) were more than friends? We are referred to the classic film "Days of Wine and Roses", a story about two amorous alcoholics and what transpires when one drunk wants to try a sober lifestyle. This play is more than a play. It speaks of films and ideas and asks why people want to have certain jobs and read (or don't read the news). As the truth is slowly revealed, we see characters struggling to hold in more information than they care to share. All of this is a triumph for director Joan Kane. Since the action covers several months and the characters rarely leave Marc Marcante's spacious set, we rely on Bruce A! Kraemer's lighting to cover up some things, reveal other things, and keep us moving forward in time. For a play called "Time Stands Still", that is quite tricky. Sarah can't get over the deceased Tariq. It seems that the more time passes, the more humane and enobled Tariq seems. Maggie Alexander as Sarah does an exquisite job of showing us what's it's like for a real mover to have to sit still and heal her wounds. Tim Weinert as James has been on the go since Sarah was injured, and shows us the agony of his own inertia. The perkiness of Connie Costanzo as Mandy and the grandfatherly joy of Malcolm Stephenson as Richard must be seen to be believed. The theater is a great place to examine the comic side of the generation gap, especially in relationships. Cat Fisher's costumes are the perfect way to feel at home, even if you're not sure what that is.